The Yum List – Best Expat Blog 2013! Woo hoo! 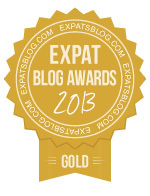 Two years running The Yum List has gained the gold prize for Best Expat Blog in Malaysia. Thank you to all of our dear friends and readers who took the time to vote for us again. We are humbled and honoured by your support and vow to serve you even better in 2014. Sincerely, your dedicated Yum List team.